Texas is, by far, the biggest and most important pickup market in the nation. 258,729: The number of new full-sized pickup trucks registered in Texas last year. This year, through April: 97,686. 3-1: Ratio by which Texas outsold California, the No. 2 pickup market, in 2012. 16%: Texas' share of overall new pickup registrations in 2012. California's share was 5.8%. No. 5: Where the Houston metro area would rank this year among pickup markets if it were a separate state. Dallas would be No. 7. Excluding both cities, Texas would still be No. 1. 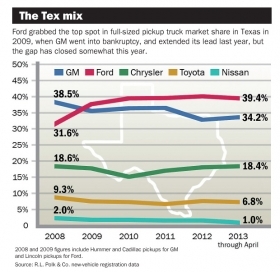 39%: Ford's share of the Texas pickup market this year through April. GM's brands trail at 34.2%; Chrysler has 18.4%. Chevrolet launched a grassroots promotional romp through Texas last week, the start of its marketing campaign for the redesigned 2014 Silverado. Chevy's glitzy displays will hit all the well-trodden stops: baseball games, big rodeos, the state fair. But also on the route are out-of-the-way spots that Chevy reckons are thick with truck buyers: an exposition for oil-field hands, a home and garden show in El Paso, a deep-sea fishing tournament in a tiny Gulf Coast island town. The statewide blitz across Texas -- General Motors calls the five-month swing of more than 60 stops unprecedented -- is just the start of a national Silverado campaign. And it highlights how this fast-growing state of 26 million people is shaping up as the key battleground in a pickup war that will grow especially fierce over the next two years. To say that success in the Texas market is critical for truckmakers would be a 10-gallon understatement. It accounts for 1 in 6 pickups sold nationally. More pickups are sold just in the Dallas and Houston areas combined than in any other U.S. state, including No. 2 California, registration data from research firm R.L. Polk & Co. show. GM believes its first redesigned pickups in seven years and strong underlying truck demand will reverse its sharp losses in full-sized pickup market share in Texas -- share that largely went to Ford. As recently as 2008, GM held a comfortable lead in Texas, according to Polk, with the Silverado, Avalanche and GMC Sierra combining for a 38.5 percent market share, compared with Ford's 31.6 percent share. But Ford surged ahead in 2009 -- the year of GM's government-led bankruptcy -- and hasn't looked back. Through April, Ford had a 39.4 percent share, compared with 34.2 percent for GM. No. 3 Ram is rising too, to 18.4 percent through April, on pace for its strongest showing since 2008, Polk data show. That explains why GM is barnstorming every corner of Texas to reach customers who either defected to rival brands or have been nursing their aging Silverados or Sierras. GM is piping as much as half of its initial national supply of the 2014 pickups to Texas, executives have said. "We've got to win in Texas to be able to win this game in truck sales," says Maria Rohrer, Silverado marketing director. "It's been seven years since we launched a new truck. We're not going to come back slow. We're coming back strong." GM's Texas swagger isn't going unnoticed by its competitors. Doug Scott, Ford's truck marketing manager, says GM's expected marketing blitz actually affords Ford "an opportunity for us to build share" in Texas, which accounts for nearly 20 percent of F-150 volume. Scott says GM's promotions will flush on-the-fence truck owners into the market, and "we're on everybody's shopping list." He also welcomes the chance to sell 2013 models against GM's new '14s, which will be light on incentives. And, in a barb that could have come straight from a Ford showroom floor, Scott says GM is at a disadvantage in the crew cab-heavy Texas market because the Silverado and Sierra crew cab isn't as roomy as the crew cab F-150, even though GM repackaged the redesigned models to improve rear seat access. He says crew cabs account for more than 70 percent of the F-150's Texas sales. Bob Hegbloom, Ram's director of marketing, says: "We've got all the claims we need to continue to go after both Ford and Chevy in Texas." Polk analyst Tom Libby says the timing of GM's rollout "could not be better," with pent-up demand and a resurgent housing market stoking pickup sales. Through May, sales of full-sized pickups are up 21 percent this year, compared with 7 percent for the industry overall, and are on pace to hit 2 million units for the first time since 2007. "They have a real opportunity to take share," Libby says. But, he adds: "They really need to take advantage now because it's a small window." This fall, Toyota, which opened a truck plant in San Antonio in 2006, will launch a redesigned 2014 Tundra, the only full-sized pickup assembled in Texas. Also this fall, Ram will roll out a 1500 pickup with a 3.0-liter diesel engine, which it says will get even better fuel economy than the 25-mpg rating of its V-6 Ram, already the segment leader. And Ford is expected to launch its next-generation F-150 in the second half of 2014. Ford reminded Texas buyers of that in February, when it rushed its hulking Atlas concept pickup down to Texas soon after its debut at the Detroit auto show and paraded it around for a month. Texas Chevy and GMC dealers say they have seen some pickup customers gradually migrate to other brands as the Silverado and Sierra have gotten long in the tooth. GM executives say that's a big reason behind the extensive grassroots push: to give customers a close-up look at the new models' enhancements. The 2014s feature much-improved interiors; stronger, more fuel-efficient engines; and nifty features such as a corner step that makes it easier to get into the bed. "We're going where the truckers go so we can get people into the truck and prove that it's got some great advantages over the competition," says Dave Nottoli, director of Chevy's south central region. "These are places that we have not been." Rohrer says GM will offer a loyalty deal on the 2014 Silverado but didn't give specifics. Rick Cantalini, general manager at Vandergiff Chevrolet in Arlington, Texas, says Chevy dealers "can claim our customers back and conquest new ones" with the redesigned truck. He's happy to see GM's early promotional push in Texas, an element that he says was lacking on the last truck launch in 2006. "Share of voice is always something that Ford has done a very good job on," says Cantalini, a member of Chevy's dealer advisory board for full-sized trucks. "General Motors wants to address that in Texas for this special launch." 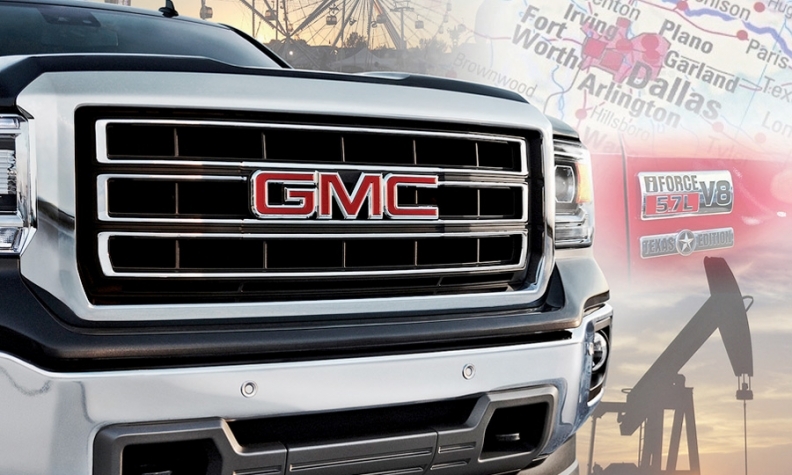 Tommy Brasher, a Chevy and GMC dealer in tiny Weimar, Texas, vows to make the most of his state's "unfair share" of GM's early 2014 pickup allocation. "Now's not the time to thumb our nose at the rest of the dealers in the United States because we got a head start," Brasher says. "It's time to get out there and sell 'em."